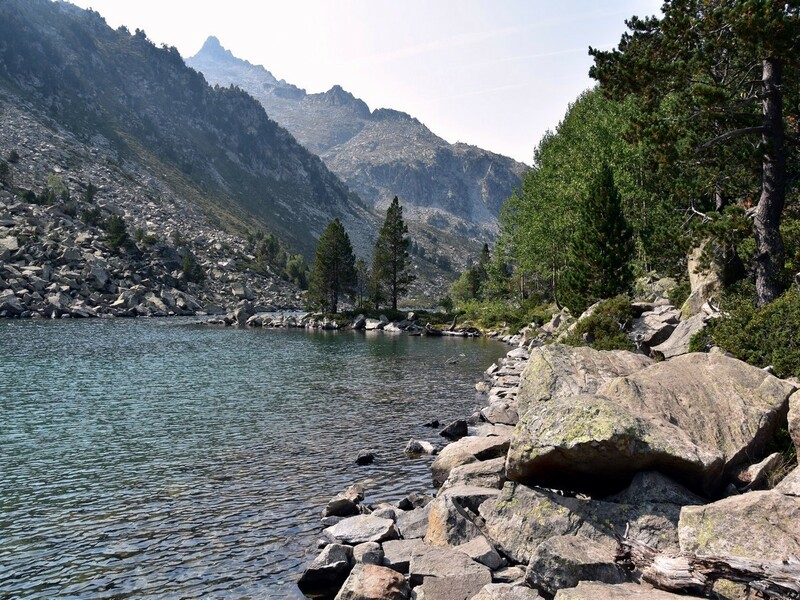 This hike, starting from the Lac d'Orédon, takes you through the wild, magical landscapes of the Néouvielle. 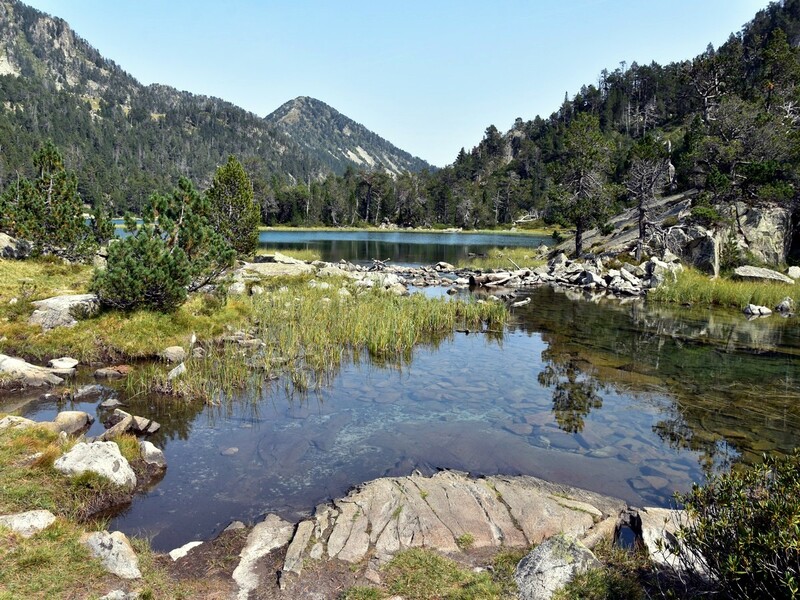 Hike by Les Laquettes, Lac d’Aubert and Lac d’Aumar, a series of beautiful lakes surrounded by dramatic ridges. Yet another beautiful hike in the Pyrenees. Drive south along the D929 through the towns of Arreau and St-Lary-Soulan, until you reach the village of Fabian. Turn right in the direction "Réserve Naturelle du Néouvielle". Drive up the winding road for 10.5km and turn right to reach the car park at the Lac d'Orédon. This walk starts from the car park at the E end of the Lac d’Orédon (take a ticket at the entrance and pay when you leave). 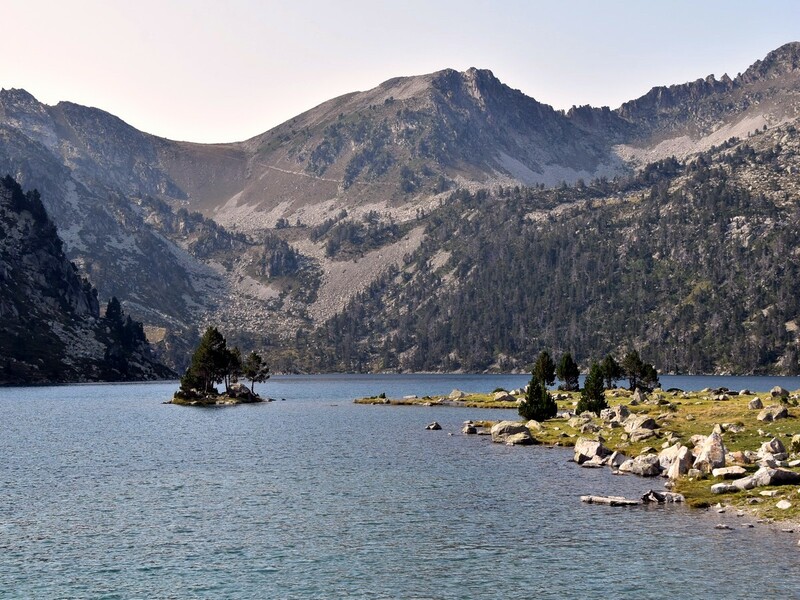 The scenery over the lake gives a hint of what the journey will look like: lakes, pine trees and rocks, surrounded by fine, sharp rocky ridges. Find the trail at the north-west end of the car park, where a signpost shows “Sentier des Laquettes”, “Laquettes 0h40” and “Lac d’Aubert 1h15” (the times indicated are for regular walkers, so allow a bit more if you are doing the walk with children). 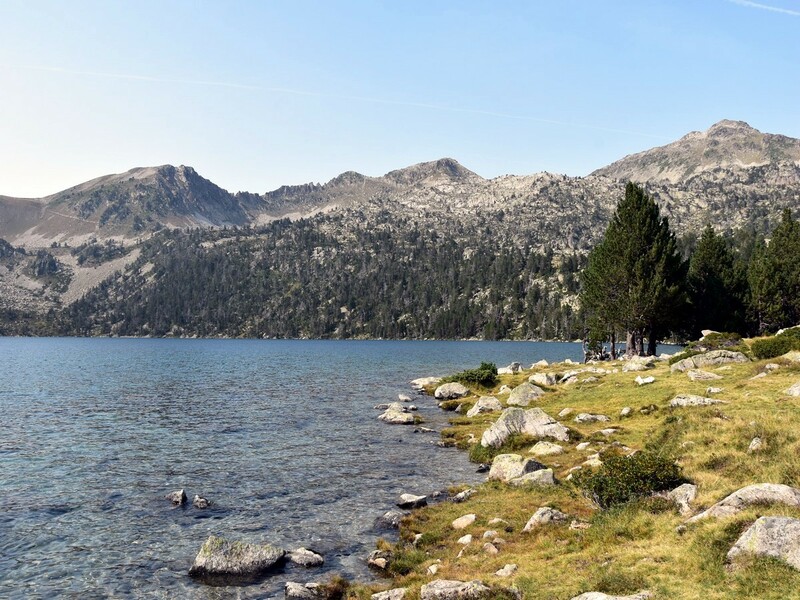 Follow the unmarked but well-defined trail which gently rises through the pine trees along the end of Lac d’Orédon. After a short while, it steepens a bit just before reaching a lovely waterfall. From the waterfall, the trail starts rising more significantly, winding its way up through the forestry. Despite the numerous rocks and tree roots, the path is fairly easy to follow, and the trees provide some shade. There are a few sharp turns along the way, so just make sure you stay on the main, wide trail and ignore some narrower paths you may see to your right. While going through the trees you will meet two bends of the restricted access road to Lac d’Aubert. Stick to the trail which continues left of the road, following the stream after the first bend. After seeing the second bend in the road, take a sharp turn left turn. The ground flattens shortly afterwards and you will soon have Les Laquettes in view. “Laquet” or “Laquette” mean “small lake”, and there are three of them nestled there at the foot of the Pic de Hèche Castet (2568m), shining under the sunshine like jewels and connected by a stream. Follow the trail along the right bank of the lakes. Shortly after reaching the third lake, you may have the feeling the path has disappeared. Don’t worry, just stick to the rocks along the edge of the lake. This leaves an impression of walking on stepping stones and the kids will surely love it! After a while, a dam will come into view. 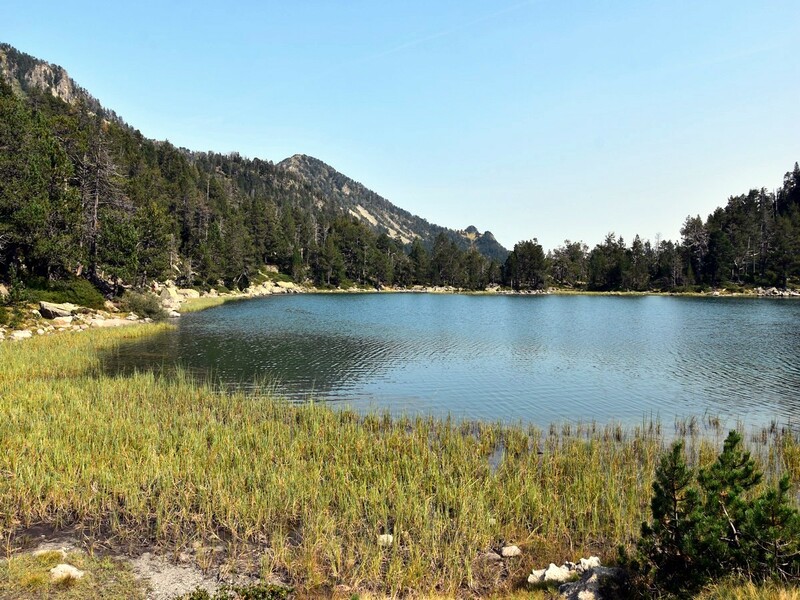 This is your next destination, the Lac d’Aubert (2147m). 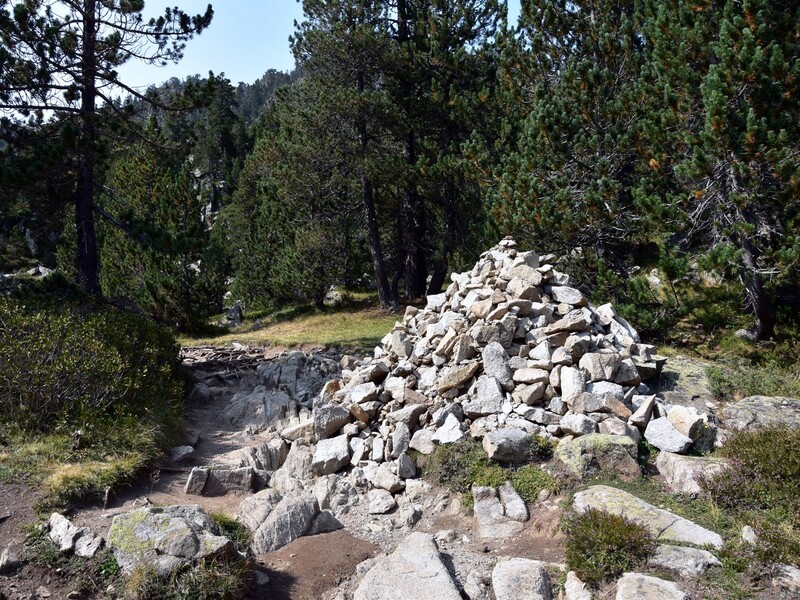 The main trail is well marked with cairns and rises gently on the open ground, through a mix of low bushes and massive rocks, and veers right just beneath the dam. As you will reach the lakeshore, you may let out a “wow!”. This indeed is one of the biggest lakes in the Néouvielle and is surrounded by some of the highest summits of the area. Follow the right bank for a while then head for the car park to your right. 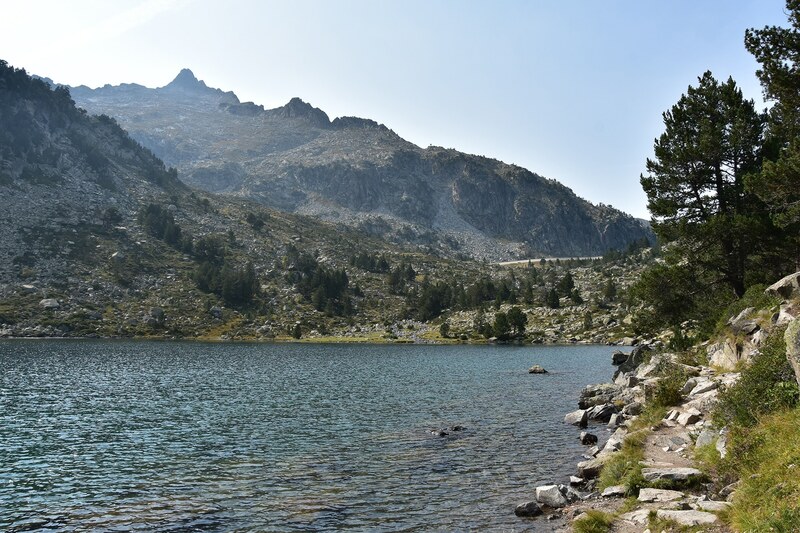 You could be tempted to stop the walk here, but this would be a mistake as another jewel of a lake lies only a few minutes away: the Lac d’Aumar. Take the main track left of the car park (where a sign says “Lac d’Aumar 15min”). There are less than 40m climbing left, and the ascent is rather gentle. After about 500m, turn right at the sign “Lac d’Aumar 200m“. 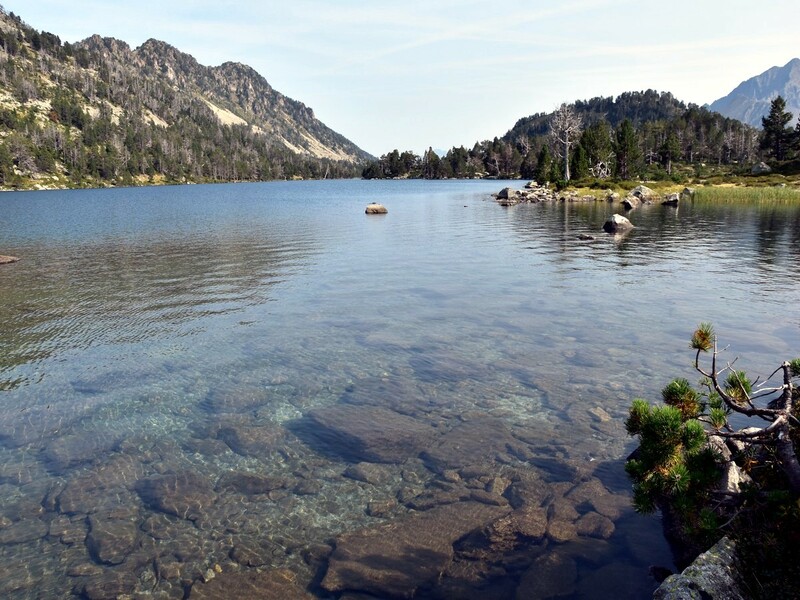 The Lac d’Aumar lies at 2089m and looks even wilder and clearer than the other lakes: nature at its best! The scenery is fantastic, dominated by the Pic de Néouvielle (3091m) and the spiky Pic de Ramoun (3011m) to the WSW. From there you can either retrace your steps the same way to the Lac d’Aubert, or head SE along the lakeside, following the GR10 (red and white marking) until you reach a little stream. Cross the stream and pick the path to your right which will lead you back to the main track you came up, turn left and you will soon be back to the car park near the Lac d’Aubert. From there, descend by way of ascent. The "Réserve Naturelle du Néouvielle" was created in 1968 and is run by the Pyrenees National Park. It is the host to many species of plants and animals, some of which are endangered. This hike can be done with children but may not be suitable for the youngest, as the terrain is rather uneven. 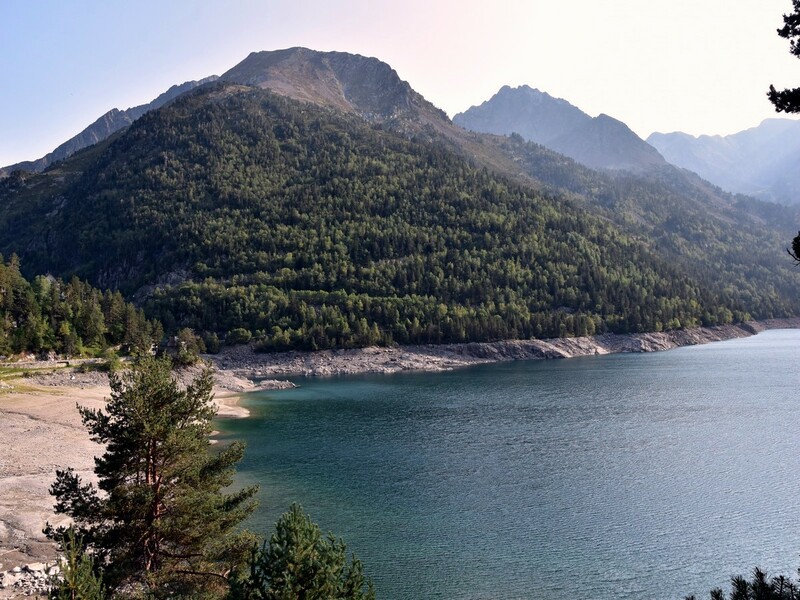 An easier option in high season is to take the shuttle bus (free for children under 10) which operates between 9.30am and 6.00pm from the Lac d'Orédon to the Lac d'Aubert. 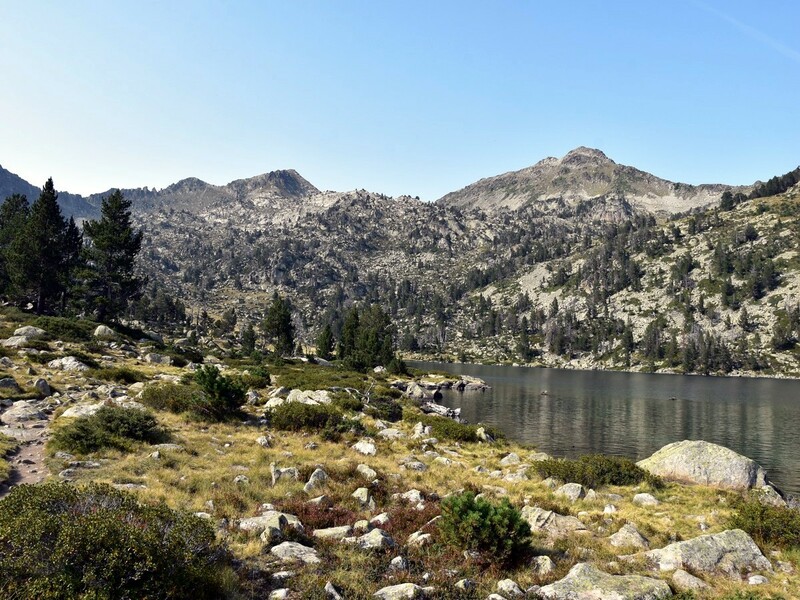 From there, it is a gentle stroll out and back to the Lac d'Aumar (about 1.0km and 40m ascent). It is only possible to drive up to the Lac d'Aubert before 9.30am and after 6.00pm for the same fee as the car park at the Lac d'Orédon. The Refuge d'Orédon is just near the car park at the start of the walk and is a great place for a refreshment or a snack. If you have enough time and energy for a longer hike, there are numerous options in the area. You can use the same ascending route to complete another, longer loop walk, following the GR10 from the Lac d'Aumar in a SE direction. Around 2220m, below the Col d'Estoudou, take the path to the right which heads west, back down to the Lac d'Orédon. This would add about 3.0km and some 150m ascent. 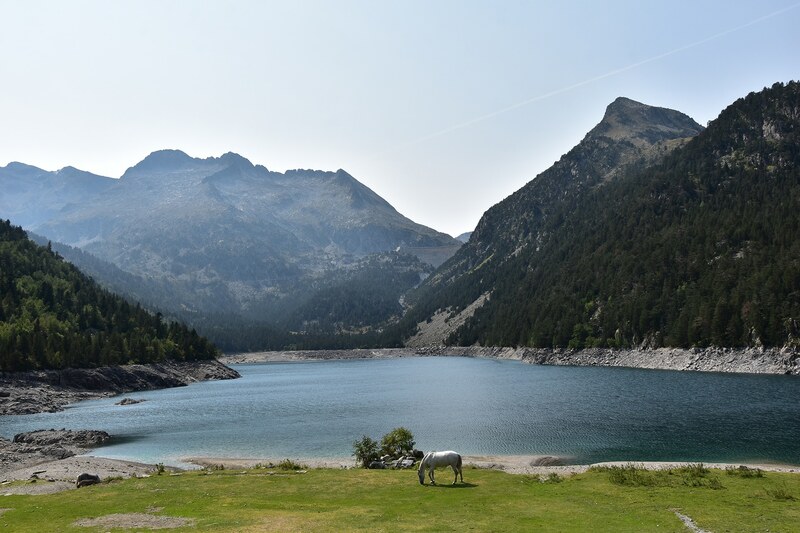 Other options include reaching the Col de Madamète (2509m), following the GR10 north of the Lac d'Aumar, or tackling the Pic de Néouvielle (3091m) by crossing the dam at the Lac d'Aubert -note that this is one for the very experienced only, as the going is very tough and some scrambling is required below the top.